This was the subject line of an email that popped up while I was wracking my brain (unsuccessfully) to come up with an interesting way to start this article. Since I wasn’t getting anywhere anyhow, of course I stopped and read the email, which was quite nice and encouraging. But that subject line kept drawing my attention. There was something not quite right about it. I mean, do we really have this? Is it really about us? Is the answer to our frustrations as teachers a self-help motivational speech about digging down & finding strength within ourselves to somehow make it through the crazy? This line of thinking is super-popular with non-Christians because it’s all they have. But we as Christians should know better. We don’t have this. We could never have this. And, best of all, we don’t need to have this. Why not? Because GOD has this. You’re probably reading this right now because you’re (just a bit) frustrated or discouraged. You’re finding yourself in need of a pick-me-up, something that will banish the negativity and reignite your passion. But you don’t really need a motivational speech or a new technique to try. These may help for a little while, but they won’t last. What you really need is more of God. He and only He can bring you deep-down, can't-take-it-away joy, peace, and rest – despite whatever challenges or circumstances you are facing. So as we examine these 8 reasons you’re feeling frustrated, don’t ever lose sight of this truth: It’s not about YOU. YOU don’t have this. As teachers, we’re used to figuring out how to make things work. But if we’re not careful, we’ll try to teach, inspire, motivate, and even prick our students’ consciences all on our own – without relying on God to make us what we need to be. Or maybe you’ve come father than that. You’ve realized you desperately need Him, so you try to be a good teacher “with God’s help.” But listen to that statement for a minute. It sure sounds like it's still you trying to do it – and you’re just tacking on God’s help like you’d add a few bonus points to a students’ test. The problem is that this doesn’t work. How many times have you tried to somehow do better, to be better? Determined not to lose your patience with your students only to lose it again? Endeavored to stop complaining or gossiping only to fall into it again? Worked on having a good attitude towards a difficult administrator only to remain constantly frustrated by them? It’s just not working, is it? And furthermore, it’s not the message of the Gospel. Jesus didn’t come just to save us from sin’s penalty and then “help us” struggle through life. He wants to change us from the inside/out – to work His work in us, to produce His fruit. Realize that God must do the work in & through us. You see, it’s not about us trying to be better teachers “with God’s help.” God Himself must do the work in us, must change us from the inside out, and produce His fruit of love, joy, peace, patience, and more. It’s a subtle mindset shift, but it’s extremely powerful. Stop trying to be better, do better on your own. Cry out to God and ask Him to change you. He is the Potter & He has obligated Himself to mold us if we simply trust and surrender to Him. Which brings us to the next problem…. You're not really trusting God. In any challenge we face, whether it be a difficult administrator, frustrating co-worker, scary evaluation, over-reaching parent, overwhelming stack of paperwork, or even the monstrous class from you-know-where, our souls can immediately be at peace if we choose to trust God. But the problem is that we don’t. Not really. We may say we trust God, but our stress and worry reveals otherwise. But, instead, we worry about God’s plan. Fear that what He has for us may not be what we want. Secretly wonder if God might have just happened to get it wrong this time. Or speculate that this situation is so bad that maybe, just maybe, He’s not actually in control. But when we say that out loud, we see how ridiculous it is, right? God’s plans are always best. He is never wrong. And He is always in control. So what now? Choose to trust God, surrender to His plan, and leave your worry with Him. Often we bring our burdens to Christ in prayer but then immediately pick them up and try to carry them again the second we say Amen. It's like casting out a fishing line and then reeling it right back in. But what if we actually left them there – actually trusted Him to take care of them? What if the next time you were worried about your observation or your testing results, you took that to God in prayer and left your concern with Him, refusing to worry about it any longer. Yes, you’d still need to do the necessary prep work, but you wouldn’t have to carry the burden of worry any longer. You’d finally experience the great peace described in Philippians 4:6-7 Be anxious for nothing, but in everything by prayer and supplication, with thanksgiving, let your requests be made known to God; and the peace of God, which surpasses all understanding, will guard your hearts and minds through Christ Jesus. And if you're thinking that's easier said than done, I get it. But it's also easier than you might think. 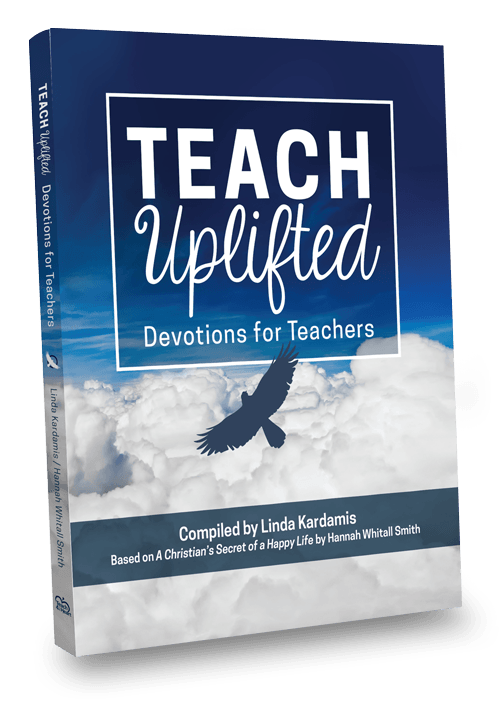 We explore all the ins & outs of what it means to trust God - and how to actually do it - in Teach Uplifted. We can’t always change our situations, but we can always choose how we think about them. The problem is that we often don’t often realize how unBiblical (and therefore untrue) our thought patterns are – or the great damage they are doing. For example, do you recognize any of these common thoughts? Despite how often we hear these phrases or even think them ourselves, all of them are decidedly unBiblical. And what’s more, they’ll leave you continually frustrated and discouraged. Renew your mind by taking every thought captive. When you’re feeling discouraged, you must first pause to pray and yield yourself to Christ. Then, analyze your thinking. Ask yourself why you’re really upset. Often, there’s a hidden reason such as our own pride or our unrealized expectations. Next, think about the Biblical truth that address your feelings. For example, if you’ve been treated unfairly by an administrator and have been telling yourself you don’t deserve to be treated like that, you need to recognize this frustration is caused by pride and the desire to be respected. But pride is most abhorant to God and must always be cast down and replaced with genuine humility (James 4:6). Furthermore, you don’t really work for your administrators. You work for God (Col. 3:23-24). So instead of choosing to worry about what your administrator or anyone else thinks of you, choose to remember that the only one’s approval who really matters is God’s. So determine to do your best but leave the results (including your own reputation) up to God. Once you’ve identified the wrong thinking and replaced it with Biblical truth, make a conscious choice to believe that truth. Then, change your thoughts regarding the situation, maybe even writing them down. Tell yourself the truth whenever your old thought patterns surface. Keep reminding yourself over and over until the old fades and new becomes second-nature. While complex spiritual or emotional issues are often at the root of our discouragement, sometimes the answer is way more simple - you're exhausted. When you’re running on empty, everything is just way harder to deal with. And it’s time you recognized the truth that you just can’t keep go, go, going without it taking a toll on your body, your mind, and even your spirit. 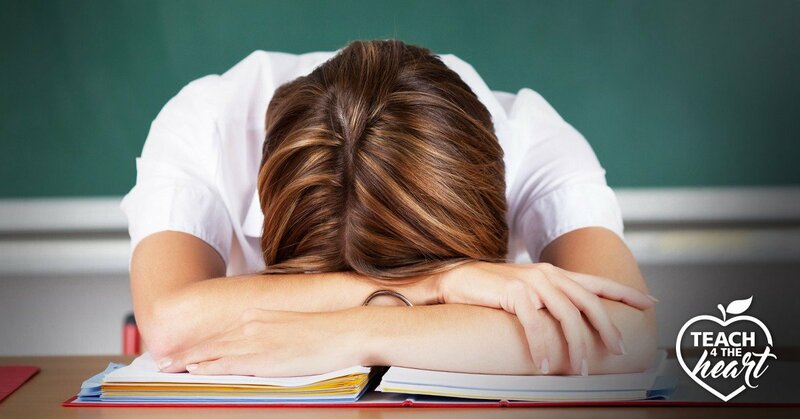 But we're not really helping our students when we're so tired we can hardly think straight. We're doing them no service when we lose it and snap “out of nowhere” because we didn’t have the energy to deal with their shenanigans today. When we go through crazy mood swings because we aren’t eating right, or simply can’t muster the energy to bring much passion to our lessons. Stop fooling yourself. You’re not helping your students, and you’re certainly not helping yourself. Your energy needs to be your priority. Starting now. Increase your energy by getting more rest, eating better, drinking more water and/or exercising. Easier said than done? Maybe. But what’s one change you could make right now? Do you need to go to bed earlier? Most of us can do that if we simply choose to. Bringing a water bottle from home so you drink more water throughout the day? Finding time for a 20-minute walk three days a week? You don’t have to change everything overnight. Just start making your energy a priority. Because it most certainly should be. Few things tend to frustrate us more than our own fellow humans. Whether it's an out-of-touch administrator, helicopter parent, unmotivated colleague, or challenging student - there always seems to be someone that just gets under our skin & causes no end of frustration. But here’s the thing: Often the frustration that we feel towards this person is a result of our assuming the worst. We just know they don’t like us. We can’t see any excuse for their behavior. Or we saw how they reacted to me so can you imagine the horrible things they must say to their students!? But what if instead of judging them or their situation, we gave them the benefit of the doubt instead? What if we realized that we may not have all the facts, all the details? Considered that they might be going through big challenges of their own that are affecting how they handle their day-to-day problems? What if, instead of letting our own frustrations rise in righteous indignation, we chose to shower them with grace? Give grace & the benefit of the doubt. When God’s Spirit is working in and through us, we can hold others in high esteem, regardless of what they do. We can remember that God loves them and that we fall short, too. We can give grace as we would want others to do for us. And the amazing thing about this is that as we give grace to others, we find that our own joy is renewed. As we stop worrying and fretting about everyone else, we find God’s peace and love filling our own hearts, and our discouragement and frustration melts away. You're trying to do everything. If your schedule is jam-packed with meetings, responsibilities, to-do’s, and activities, with no empty space to rest and refresh, then no wonder you’re overwhelmed and discouraged. Yes, I know teaching is super busy. But it doesn’t have to take over your life. And, furthermore, it shouldn’t. Here’s the thing: Too many of you are saying yes to every request that is made to you. You’re saying yes out of guilt or out of obligation. Or maybe you say yes because of a genuine desire to make a difference. But, either way, you’re missing a key principle. When you say "yes" to one thing, you're saying "no" to something else. This is simple logic. When you agree to one responsibility, you automatically give it time & energy that can no longer be used for something else. But how often do we actually consider the cost before we say yes? Instead, we think we can somehow be SuperWoman, SuperTeacher AND SuperMom. We think somehow we can do it all, but we can’t. When we say yes to one thing, we are saying no to another. And too often those no’s are going to things that really matter – our kids, our spouse, our health, our relationships, and even our spiritual life. Choose only the best things to say yes to. Then guard your time. Instead of saying yes to everything, save your yes for the very best things – the projects or responsibilities that you can really make a difference at, and which you can give your full effort and energy. Instead, determine ahead of time when you’ll leave school for the day and how long you’ll work at night. Block off time to simply be with your family or friends – and don’t let yourself think about school during those times. You know that one area of teaching that is driving you crazy? Maybe it’s how your students are always talking. Or how you spend forever grading each night. Or that new policy that just came down the pipe that is a HORRIBLE idea. Whatever it is – you feel stuck, trapped. Like there’s nothing you can do. But chances are there is something you can do – you’ve just gotta’ put your thinking cap on. Often there’s a creative solution to our biggest frustrations if we just ask the right questions. Ask other teachers how they handle the situation. Or, if you’re really struggling, invest in training like Classroom Management 101 or t﻿he﻿﻿ ﻿﻿40 Hour Teacher Workweek. Just a quick example: I spoke with a teacher who was struggling greatly with her school’s requirement of having at least 5-7 quizzes each grading period. She couldn’t figure out how to fit them in, and she was getting frustrated. I suggested simply giving oral quizzes instead of typing them out. Oh, she said, I can do that? You're trying to be perfect. Few things will drive you to despair faster than a pursuit of perfection. So please, stop getting frustrated with yourself that you’re not yet the teacher you want to be. You have to celebrate your progress, enjoy the journey, and remember that growth takes time. Celebrate progress & remember that growth takes time. You’re not the teacher now that you will be in 5 years. At least, I certainly hope not! But don’t expect to get there overnight. And don’t expect your students to be perfect overnight either. Then run from it. Cast it down. And enjoy the journey God is taking you on. Remember that YOU don’t have this. But God sure does. And He never makes mistakes. 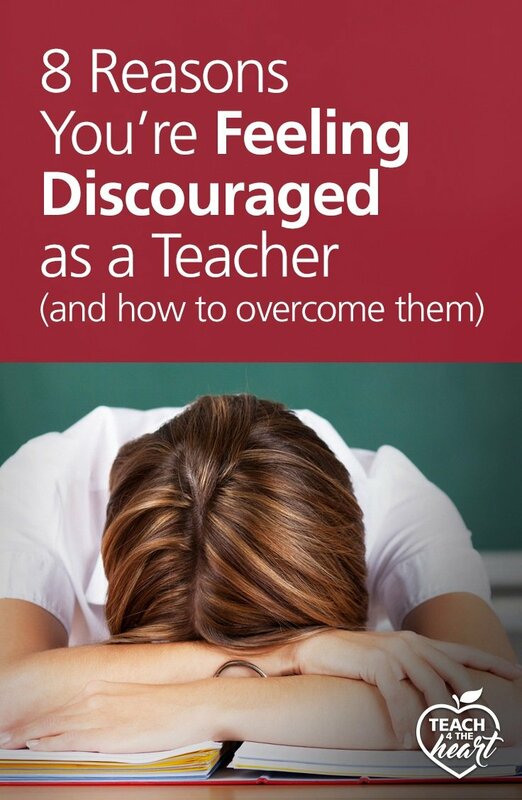 Has teaching left you stressed, frustrated, or even discouraged? But be warned: This is not a collection of light, fluffy feel-good stories. These powerful devotions will completely transform the way you view your life, your classroom, and your relationship with God. Thank you for an excellent article filled with truth and practical advice. It was spot on! I am looking forward to the upcoming challenge. I love this article. I plan to share it with my teaching staff. It will be a great encouragement in these last few weeks of the school year. Just one minor criticism- toward the end, you say, “Don’t expect to get their overnight” . It should be “there”. This was superb–so well structured and insightful from experience. Speaks exactly to the types of challenges I face from day to day. Will be saving and rereading! Thank you so much for writing this! I have been discouraged this year by my workload and class issues. This came when I needed it most. Thank you for sharing this. For some reason I see that it was written last year- but I needed this today, 2/4/19!! Thank you very much for sending it to my inbox today. If you didn’t know why you sent it- well the Lord knew– and it got to the right place. This was an awesome, timely article that was much needed. Thank you for allowing God to use you to impact, help and support teachers. To God be the glory!